It is that time of the year when Time magazine unveils its ‘Person of the Year’, when we are invited to vote for ‘Song of the Year’ on our favorite radio station, when companies conduct their year-end reviews. It is a time of reflection, of looking back, of analysing our hit-and-misses, of celebrating our successes, of hoping to better anticipate the pending new year. A time for celebrations. A time for overviews and shortlists. The time to draw up next year’s death pool previsions. There are many death-prediction listings; Ranker, Deathlist, Giraffe Boards, Rotten Dead Pool, … all of which contain the names of politicians, celebrities, sportsmen and women and royals, people believe will not make it through the next twelve months. Pondering over the likelihood that a person will die during the year to come is bad enough, acquiring points per ‘right pick’ is bad. Attaching a betting pool to the whole affair is more than bad. It is immoral. Deathlists appraise age and health. Old is weak, sick is hopeless, death inevitable. Without a game or betting component, deathlists would be nothing but dreary enumerations of the weak and ill. Add a sweepstake and voilà, a game is born. Guessing or predicting is not foreseeing. No bet forewarns or presages death. But the idea of a ‘they are soon to be dead’ – list is gruesome. And a bet always contains a secret hope, if only of a silent high five, a plus rather than a minus. We all want to win. Whereas death predictions read like evil omens, obituaries on the other hand are troves of information. Assembling the things we forgot and the facts we never knew, they read like historical documents and when well written, they do more than that. A good eulogy looks back on rather than itemizes. It describes, evaluates and contextualizes. Be it good or bad, subject to a stroke of luck and opportunism or the result of a carefully wrought plan, each lifetime has a story to tell. Whether a parent, a soldier, a lagger, a leader, lesser, grander; whether a few lines, an announcement or a full-blown article, it matters not. Anything, really, but not a name on a list, followed by a ranking and a score. Please. The decline of the newspaper and the written press in general and the increasing use of the internet have changed readers’ habits. Search engines now allow for targeted reading. Blogs and social media have shifted reader’s attention from the general to the particular. Yet at the same time we browse, we surf, we web-travel. And we stalk. Online newspapers and magazines have adapted. A front page now allows for a proliferation of topics; political headlines, sports, featured videos, finance, recommended viewing, editor’s picks, IT, education, even the obituaries. As such, perhaps the obituary has become too vague, too distant. Perhaps eulogies are a little too celebratory of the great deeds of the great of the earth, leaving too little time and place for the human factor. Perhaps that is how death lists persist. If you are a celebrity, a big name, a famous name, a star, a VIP, you can be sure that somewhere, in the drawers of the obituary section, your file is ready, waiting for an update, waiting to be pulled out and printed. It is a sign of success. Whether or not, in another drawer, there is a sweepstake ticket with your name on it, …. 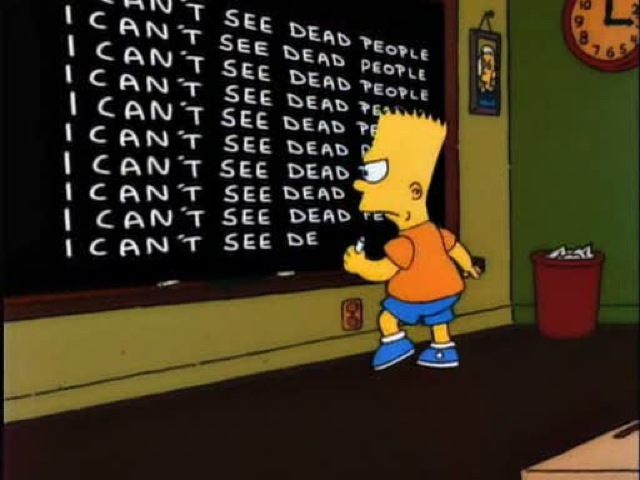 Posted on 11 December 2014 by MrsCalvo	This entry was posted in Popular Culture and Entertainment and tagged Bart Simpson, death pool previsions, Deathlist, Obituary, Time Magazine. Bookmark the permalink.